NWDS provides Alaska internet marketing, website design and SEO strategies. We manage your online presence so that you stay busy doing what you do best: running your business. We work on a platform that automates the distracting, mind numbing tasks so you have more room to be creative, get things done, and focus on the bigger picture. We live on beautiful websites. So don’t worry about your internet marketing strategy. We are here. Responsive. Beautiful. User Friendly. We develop websites that speak to your customers. Custom full service marketing designed around cutting edge SEO, engaging content, and active social media. We take care of everything, and convince your customers with blogs, ebooks, videos, and more from in house journalists. Want to be at the top of Google search results? Our SEO experts will make it happen. Old school, advertising methods of marketing are dying. People don't pay attention video advertisements, reads flyers or pamphlets, or care about the radio. With the rise of social media, reliance on custom searches, and constant access to the internet, buyers are more empowered than ever before. So turn your Alaskan website into a magnet. Create fantastic content. Rank first in search results. Beat out your competitors. Don't waste your time on burnt out methods. Internet marketing is your new weapon. Use beautiful imagery, high ranking search results, and social media to get people onto your website. Generate interest in your company by giving it a strong personality with creative blogs and unique content. Convince customers that you are right for them with quality service offers and interactive content. Keep customers coming back with the same fantastic online presence that brought them there in the first place. Give us a call! Speak with one of our skilled Marketing Advisors who will answer any questions you might have. We will walk you through the steps your company can take to transform your current marketing and sales. Curious about how your webpage performs with design, development, and search engine optimization? 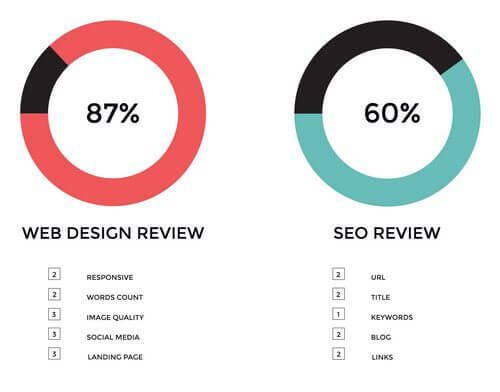 Our grading report is totally comprehensive of a website, and includes all important aspects of attracting and convincing customers through SEO, high quality web content, and efficient design. And the best part about it: it's free. We only require your website URL and your email. We will email you to confirm before conducting the analysis, and upon confirmation we will provide your report within 24-48 hours.